Characterization of protein- protein interactions is a vital aspect of molecular biology as multi-protein complexes are the functional units of cellular processes and defining their interactions provides valuable insights into their function based on a “guilt by association” concept. To identify the components in complexes, purification of the latter near homogeneity is required. The tandem affinity purification (i.e., TAP) method, coupled with mass spectrometry have been extensively used to define native protein complexes and transient protein-protein interactions under near physiological conditions (i.e., conditions approximate of the internal milieu) in Saccharomyces cerevisiae. Generally, TAP consists of two-stage protein enrichment using dual affinity tags, a calmodulin-binding peptide and a Staphylococcus aureus protein-A, separated by a tobacco etch virus protease site, which are fused to either the C- or N-terminal of the target protein. TAP-tagging has proved to be a powerful method for studying functional relationship between proteins and generating large-scale protein networks. The method described in this paper provides an inexpensive single-step purification alternative to the traditional two step affinity purification of TAP-tagged proteins using only the calmodulin-binding peptide affinity tag. 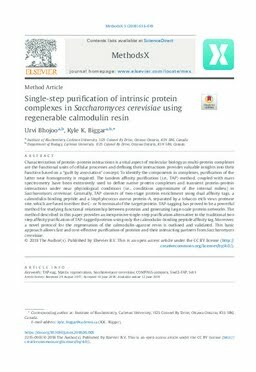 Moreover, a novel protocol for the regeneration of the calmodulin-agarose resin is outlined and validated. This basic approach allows fast and cost-effective purification of proteins and their interacting partners from Saccharomyces cerevisiae.